The Whidbey Allied Artists December Show is fast approaching! 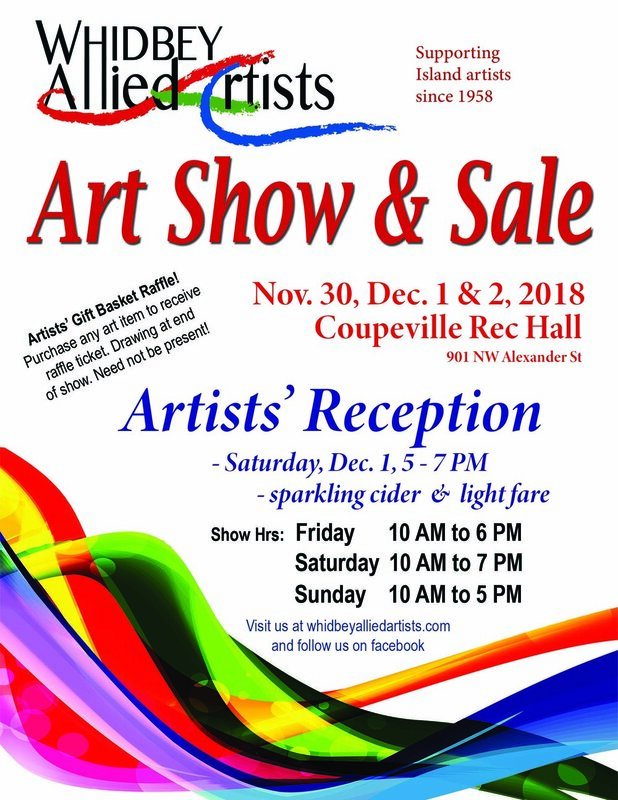 The show will be at the Coupeville Rec Hall, on November 30th through December 2nd. Please see the poster below for details and hours each day. Whidbey Allied Artists is a non-profit organization in Washington state with a membership of artists with diverse talents, interests and experience. We do not have a “permanent” home, but define ourselves as a “floating” gallery. Our goal is to provide a wide variety of art to the public. Our association is exceptional in its endeavor to provide a venue for artists to exhibit their work and to give the public an opportunity to purchase a piece of original art for their own collection. Anna Davis – Northwest Oil Painter - Artist Statement Born in the Northwest and raised by nature loving, artistic parents, art has been woven into my life from an early age. Drawing was strongly encouraged as a family activity, when I was young. My parents’ natural talent to draw and see artistically, allowed my artistic expression to flourish. They would often challenge my brother and me in drawing contests with grand prizes. Eventually, we moved from Portland to Kirkland, Washington which was the region I remained for 15 years. While there, I attended the Seattle Academy of Fine Art, attended Life Drawing classes at Daniel Smith and spent three months in Italy at the Florence Academy of Fine Art. Most of my art education has been in the Classical style; aiming to capture the likeness on paper or canvas. Expressing mood, thought or a scene has been the challenge and a constant pull within me. This explanation reveals my choice for subjects. Live scenes and subjects I relish. The simple placements of everyday items I tend to fall in love with. The humble simplicity I try to share with our society which is often frantic and complicated. Animals are a fascinating subject, having been a large part of my life. I love to delve into their poses and seek out their unique personalities, and spirit. I reach for an understandable expression to portray these special beings, which photos often lack. These various subjects circulate through my mind and creates an endless supply of inspiration. Many years later when I met my husband, we migrated to Whidbey Island in 2009 and have been cherishing the Island life since. Living in such a beautifully rich area has cultivated my artistic expression even further, inspiring new views and subjects. This lifestyle and nurturing culture has encouraged me to continue challenging myself with new view points, subjects and technique. Though, I remain steadfast to my favored medium, oils. The fluidity of oil paint, the varying texture and color abilities pair beautifully. 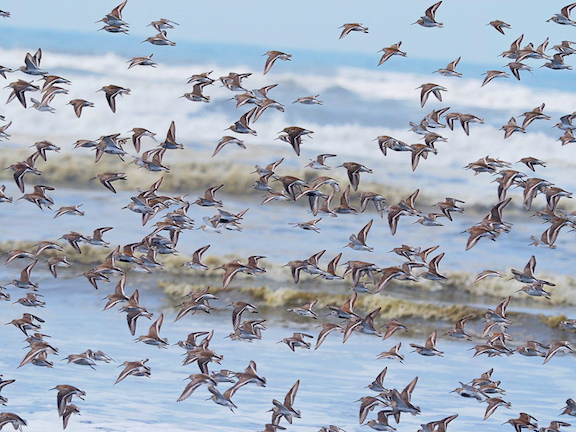 The wide characteristics of oil allow such maneuverability to portray a bird’s feathering, a solid and sparkling glass or the elastic skin of human. I truly relish this meditative approach to painting as my effort to slow my mind and body and to treasure this world filled with delicate and mysterious wonders. 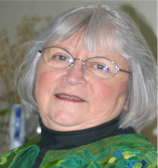 Whidbey Allied Artists welcomes our newest member, Patti Webber! I am a life-long artist and design advocate, nurtured and professionally schooled from a very young age. I provide art and design services to interior designers, real estate agents and small business owners throughout the Pacific Northwest. 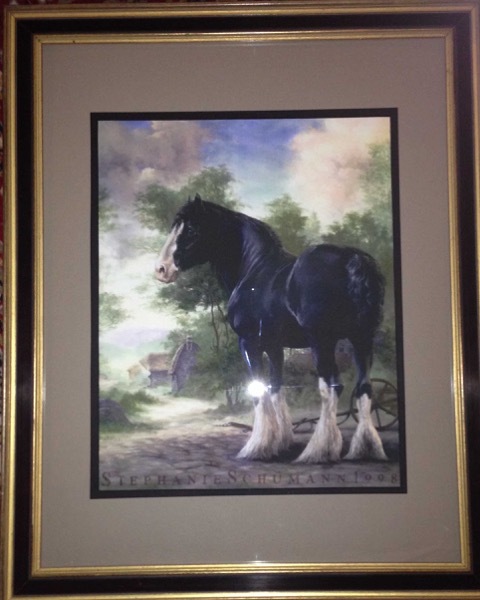 I work predominately in acrylics, and I will paint almost anything! 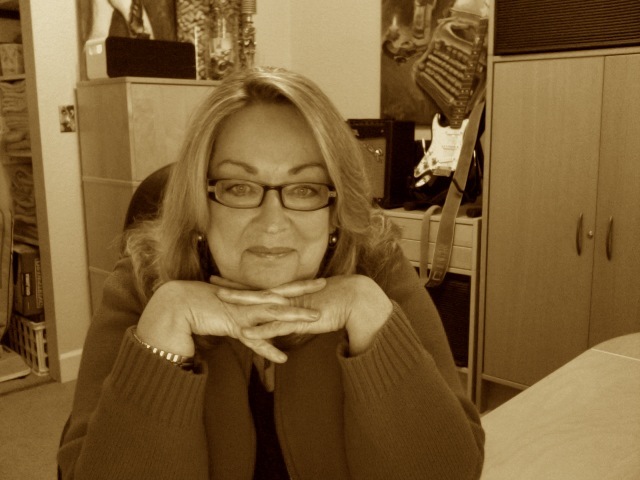 I am a “design–aholic”, with a passionate approach in keeping art and design personal, and affordable. My style is eclectic; colorful and bold, unique, whimsical, and sophisticated...just like yours! I work within modest budgets and love to re-use and recycle those things people love… things with great design bones, or special sentimental meaning! Bringing affordable art and design into people’s lives has grown into a personal decorating ministry that is continually evolving, and that I am excited to share with you! Whidbey Allied Artists welcomes four new talented artists into our group! 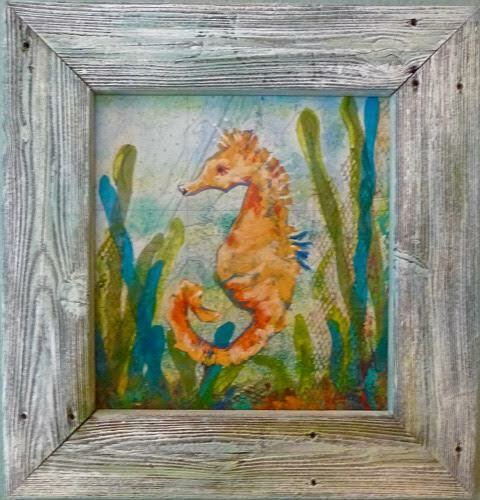 Marjie Bachert adds a new twist on typical paintings with her fiber art. She says, "I like to combine fabric collage with hand and free machine embroidery and have used this technique for several of my compositions. I am also combining patchwork and quilting with embroidery. Referencing my Arizona origins I have done a whole series of art pieces based on the Sonoran desert. The theme for my diploma was trees and so I also have a whole series based on trees mainly the ones in my yard. My work has been published in Quilting Arts Magazine and displayed at the La Conner Quilt and Textile Museum and the Schack Art Museum in Everett, WA." Sylvia Edwards has been impressing the Dottie Sanders' Monday art group at the Oak Harbor Senior Center for several months with her amazing acrylic paintings. 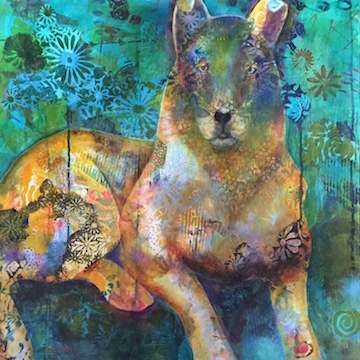 She tells us that her " foundational art training was received during her high school years from her art instructor William Lybergger, who encouraged non-petroleum and non-solvent artwork and original works. Deciding to pursue art in higher education she enrolled into Southwest Baptist University in Bolivar, MO in 1979. Her studies included various training focusing on oil painting and 3 dimensional sculptures in clay and wood. In 1983 she received a BS in Fine Art." She also served 20 years in the US Navy before coming to us. Mary MacGowan, contemporary shell artist, was a 2014 member of WAA and then took a year off. You may remember her amazing mussel shell installations at one of our shows back then. She says she wants to join us again, this time creating smaller pieces that will hopefully be more salable and MUCH easier to haul around to shows! Stephanie Schuemann is known by many local artists as a favorite teacher of drawing and portraits. Her talents and mixed-media interest range from oil paintings to graphite drawings. Her painting of the English Shire was recently displayed, among several others, at the Coupeville library. 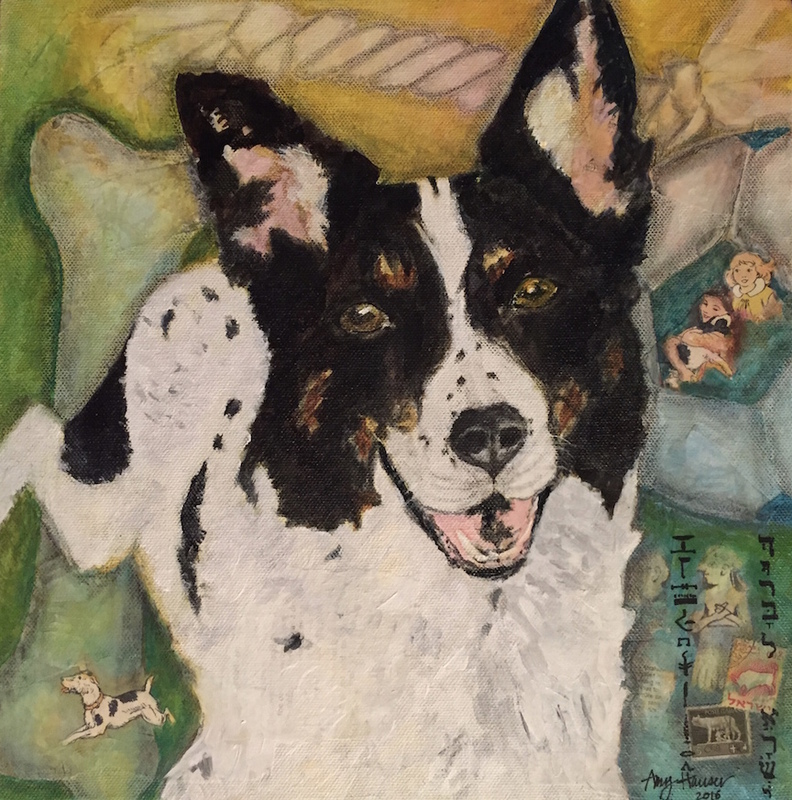 Bobbi Bradley lives in Coupeville, WA and has been painting for several years. In 2012, Bobbi became a Certified Bob Ross Instructor in the famous Bob Ross Wet-on-Wet Technique® of landscape oil painting. Bobbi shares her passion for painting by teaching the Ross-Style to small groups of students in her home studio. Most students have no painting experience, but do have a passion to paint. Her teaching method is step-by-step giving each student individual help throughout the class. 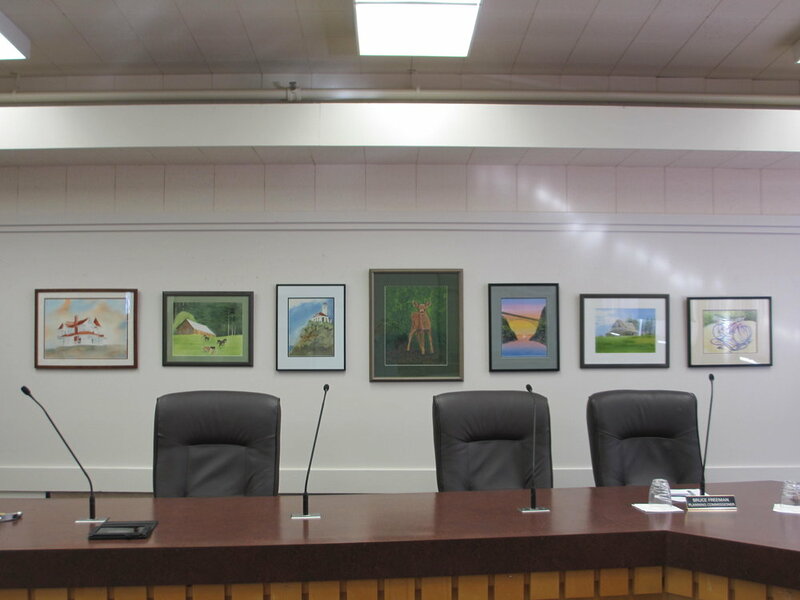 WAA President, Carole Dawes is showing her work in the Oak Harbor City Hall Council Chamber for the months of March and April. You can stop by and see her display during office hours as long as there is not a meeting going on. The work is also shown on TV when the council meetings are televised. If you are interested in showing your work in this venue, contact WAA member Shirley Taft at 360-720-2465 or penguin008@comcast.net. You do not have to be a member of WAA to display your work. The mission of Whidbey Allied Artists is to provide our community with a "floating gallery" of diverse, high quality art by local artists in a professional setting, and to inspire, mentor, and create educational and participation opportunities to artists in the community.